As the days progress, we ask about democracy, its application and prospects in our society. His animation, as to the participation of citizens in political life, is also defined as a major topic of concern. We need participation to form a society in adaptation to the people living in it, out of a technocratic regime where “managers” are the leaders of a democracy that is held in a voting paper that few support ; to develop mechanisms, such deliberation or advice, that would become, without participation, mere objects of desire of researchers or political utopians. Participation in political life thus becomes essential for all democratic development that suggests the idea of living together. Is an essential quality of a community policy and assimilate to the degree to which democracy satisfy political life and help to self-realization (Fishman). However, the literature indicates that political participation through a difficult time, particularly the turnout (Fieldhouse, Tranmer & Russell), and it’s that’s why participation need news forms. To this end, urban planning, for his contemporary relationship with participation in the sense that many urban projects involve citizen consultation, must also develop new forms of participation. And Dreamhamar is a very good example. We are in a triangular design between Ecosistema Urbano, online participants and citizens of Hamar. In my opinion, this is a pattern that makes fuller participation as it responds to quantity and quality challenges of participation which are related. It’s a way to integrate people who want to get involved in the project and may make additional proposals through the variety of their profiles and their concerns. And integration of new technology is also in this direction (ease and speed of information, online and interactive participation, etc.). 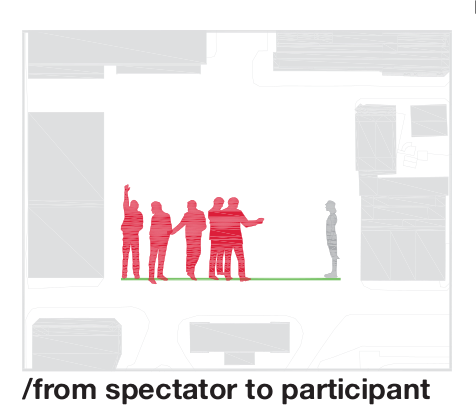 As a result, I enjoyed the continuation of this participatory design that proposed Silvia through terminals located on Stortorget, but this should be just the beginning. We must build on this momentum participatory initiated by EU and the various participants, to make the identity of Stortorget. And therefore, what is more participatory than self-construction! Build its square is design it but also lay the stones to where we live. Admittedly, citizens of Hamar are not construction workers, but they can be involved in the process of physical change in the square. This may have cost advantages, but overall in terms of identification with the place. Specifically, by linking with a previous post, this can be realized in the construction of street furniture as suggested by the project “Guerrilla Bench” : thus, the people of Hamar, by following some predefined templates for concept issues, could be involved in workshops to build furniture that would take place on Stortorget. But I believe that behind this reflection focused on Stortorget, there is also the idea that participation is not limited to consultation and the possible construction of the site, but it is part of the identity of this. However, participation means being involved in something and, as political scientist, I would like Stortorget become a tool, or at least, a place of political participation. To meet this goal, we must imagine various aspects : elements wich can stimulate participation, because involve citizens in the colective (urban agriculture?) ; the adaptability of the place in participatory practices (an Agora ?) ; and the configuration of public space to allow civic interactions.